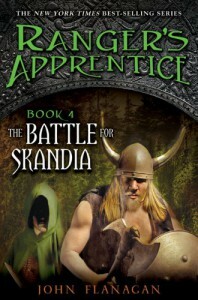 This review contains spoilers for the first three books of the Ranger's Apprentice series. Will and Evanlyn, with some help from Erak, have escaped slavery and drug addiction and are making plans to return to Araluen. That is, until Evanlyn gets herself kidnapped (again), and Will discovers an enemy of the Skandians, who is eventually interested in invading Araluen. This means he'll have to combine his powers with the Skandians so he can save Araluen and Evanlyn.